It's time to try out a curved smartphone if you're an early adopter bent on the trendiest devices, and the LG G Flex 2 is the latest curved phone to fit that description. If you're not buying the forthcoming Samsung Galaxy S6 Edge, this sequel to the the world's first curved smartphone, LG G Flex, feels less like a big, over-priced oddity. That's because the G Flex 2 is smaller, yet more powerful and still very much curved. So just what has changed? And is the G Flex 2 enough of an improvement to have mainstream appeal? Read on for a run-down of how these two handsets compare when it comes to their design, screen, power, camera, interface, battery, price and storage. The LG G Flex and LG G Flex 2 have largely similar designs as you might expect. Both phones have a curved body and buttons on the back, while the front of both phones is almost bezel free at either side of the screen. But there are some differences. For one thing the LG G Flex 2 is a lot smaller and lighter, coming in at 149.1 x 75.3 x 9.4mm and 152g, compared to the G Flex's 160.5 x 81.6 x 8.7mm and 177g build. As you might have noticed from those numbers though, the original G Flex is actually a little slimmer, though only at the thinnest point. Fans of colourful phones have reason to upgrade to the LG G Flex 2, as while the original G Flex was only available in silver, the new model can be found in both silver and red. Going beyond appearance, the LG G Flex 2 has been designed to be easier to grip than its predecessor and the self-healing powers have been improved too. Light scratches disappear in as little as 10 seconds, an improved over the original's 10 minute wait time. It still doesn't work well for normal scratches. One of the biggest improvements found on the LG G Flex 2 is its display. Once you get past the fact that it's curved the original LG G Flex has a slightly underwhelming 6-inch 720 x 1280 screen, giving it a pixel density of just 245 pixels per inch. 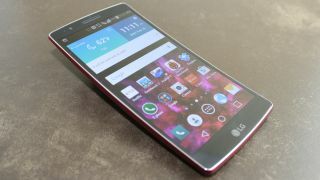 The LG G Flex 2 can't quite match up to the QHD LG G3, but it does have a 1080 x 1920 display and it's smaller than the G Flex too at 5.5 inches, giving it a pixel density of 401 pixels per inch. That makes it noticeably sharper than the original G Flex, while the smaller size makes it easier to use one-handed. Neither handset lacks power, but the original LG G Flex is starting to show its age with a 2.26GHz quad-core Snapdragon 800 processor, while the LG G Flex 2 has a 2.0GHz octa-core Snapdragon 810 processor. The new phone is faster thanks to its 64-bit chip and Android Lollipop. It has the same 2GB of RAM, but LG G Flex 2 features a newer Adreno 430 GPU, an improvement over the Adreno 330 in the original G Flex. We found Inconsistent CPU speeds, but it was still faster than the G Flex in almost every benchmark test we ran. Both handsets have a 13MP snapper on the back, but the G Flex 2's is by far and away the better of the two. Optical image stabilisation and a dual LED flash are among the camera upgrades. The LG G Flex 2 also has a laser autofocus and new software features, such as Gesture shot. It allows you to activate a selfie timer by making a fist, while if you hold the camera down after taking a selfie the screen will automatically show you the photo. Though the actual camera that you'll be taking selfies on is just 2.1MP, just like on the original G Flex.